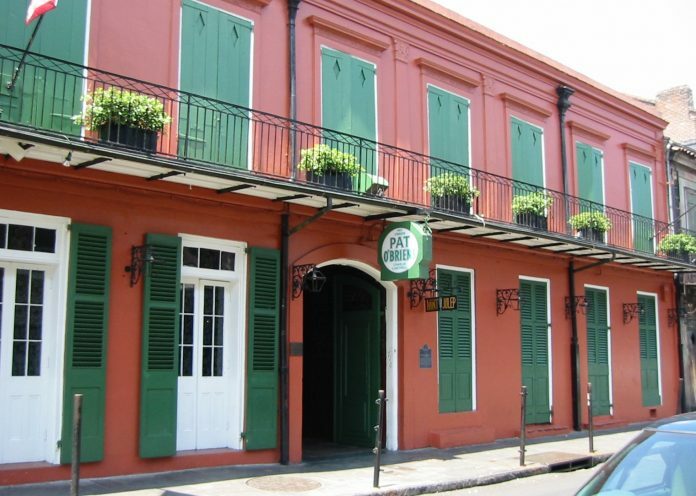 A New Orleans bar called Pat O’Brien’s is neither the oldest nor the fanciest in the city. Yet it’s an icon of the French Quarter, a location to which nearly every tourist makes a pilgrimage. Numerous explanations could be advanced for the bar’s persistent popularity, but I think it comes down to a simple formula: strong drinks, reasonable prices, and atmosphere. Their motto since they opened in December 1933 has been “Have Fun!”—not especially clever or inventive, but to the point. Truth be told, it’s a euphemism for “Have Rum!” At Pat O’Brien’s, the distinction between the two is vague at best. But you can buy a hurricane anywhere in the city, and every gift shop sells Pat O’Brien’s Hurricane Mix so you can make them at home. The drink is only part of the equation; atmosphere and an indulgent attitude are the rest. There is, I have been told, indoor seating at Pat O’Brien’s—including two separate bars and a dining room—but I’ve never seen it. The several times I’ve gone there, everyone who’s anyone was seated out on the Patio—a large outdoor courtyard, at the center of which is a flaming fountain. I have never figured out how they engineered this thing so that the water doesn’t extinguish the fire, but it’s extremely impressive. Likewise, rumor has it that the establishment has a respectable kitchen, but I can’t recall seeing anyone eating. Food, after all, would tend to dull the effects of the alcohol. Come to think of it…that could explain why I can’t remember seeing any food. Your waiter will hand you a booklet featuring photos of all their specialty drinks—concoctions with names like Cyclone, Squall, Breeze, and Typhoon—each in a distinctive glass. The booklet explains why each drink appears to cost about $3 too much: the bar assumes most patrons will want to take their glass home as a souvenir. Rather than policing the customers and charging shoplifters a fine, they do the reverse: offer you a refund if you turn in your empty glass at the counter. If you take it with you, an attendant outside the restaurant will package it in a cardboard holder for safekeeping. Pat O’Brien’s has franchises in Orlando and San Antonio (and previously had locations in Cancun and Memphis), as well as a thriving online business selling glasses, drink mixes, T-shirts, and tchotchkes of all kinds. But for the best and most authentic hurricane experience, go to the source. And don’t forget to steal your glass. Note: This is an updated version of an article that originally appeared on Interesting Thing of the Day on October 16, 2003, and again in a slightly revised form on March 5, 2005.